Eggs are a great source of Vitamin B Complex. You can also get Vitamin B Complex in the form of supplements. Vitamin B Complex can work to improve overall skin health and even reduce acne and breakouts. 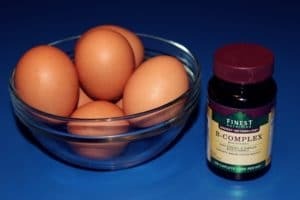 Increasing the amount of Vitamin B complex in your body can improve energy, amino acid metabolism, and facilitate steps required for cell division. Vitamin B complex reduces the possibility of getting pimples and blackheads, because it increases protection against skin bacteria. Vitamin B complex cannot work by itself, though! You need to help by washing your face properly twice a day, removing all makeup before sleeping, avoiding stress, and keeping chemicals and hair products off of your face. Vitamin B Complex is one of the few vitamins that plays an important role in cell metabolism. In general, supplements containing all eight are referred to as a vitamin B complex. Individual B vitamin supplements are referred to by the specific name of each vitamin (e.g., B1, B2, B3 etc.). The B Vitamins are essential in maintaining the health of the skin, hair and nails. They reinforce proper brain cell function, and improve liver health. B vitamins are water-soluble so they are not stored in the body and need to be replenished every day. Where is Vitamin B Complex found? It is found in products such as liver, whole-grain cereals, milk, rice, nuts,fruits, fish, eggs, meat, and many other foods. It is also found in separate types of Vitamin B, but that is not Vitamin B complex. Vitamin B Complex is all the vitamin Bs together. Vitamin B complex can be taken as a supplement, also, which is very popular. What else does Vitamin B Complex help with? Although Vitamin B Complex is helpful for acne sufferers, it can prevents skin disorders, moodiness, restlessness, irritability, insomnia and fatigue, which is important for maintaining a happy, healthy lifestyle. They reinforce proper brain cell function, and improve liver health. They also strengthen bones and muscles, improve energy production, helps metabolic functions, and relieve PMS. To learn more about nutritional supplements for acne, please call 602-505-3812 or book your appointment online now.